We were thrilled to have our good friend and basketball icon, Pat the Roc join us in the Dish Lab to demonstrate a few of his favorite workouts on the ALL NEW Dr. Dish CT machine. 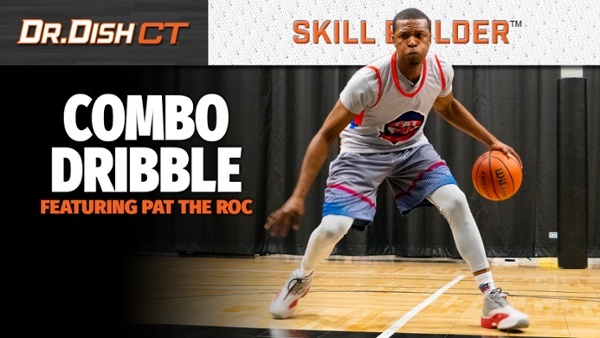 In this workout, Pat focuses on a combo dribble sequence which contains both shooting and ball handling drills. His pro tips are key when executing the workout and focusing on the details. This is just one example of the 100+ on demand workouts that come with the Dr. Dish CT.
Watch the entire workout in action below! Each Dr. Dish CT workout and drill previews are displayed on the 15.6" touchscreen which allows players to follow along and learn from experts like Pat the Roc, Drew Hanlen, Jordan Lawley, Jefferson Mason, etc. through the entire workout. The CT also allows coaches and trainers to create and upload their own workouts to the machine as well to customize workouts for individual or small groups of players. Much like any Dr. Dish smart machine, all of the stats can be saved and uploaded to the Dr. Dish Training Management System as well for accountability and progress tracking! Stay tuned for more much great content coming on the Dr. Dish CT.